We've been moved into our new home for about two weeks now, and we're already underway completing renovation projects and making this house feel like a home. The first room we tackled was our master bathroom. Because we have our master bedroom already set how we want it, we decided this would be a good place to start since there isn't an actual door separating the two spaces, the bathroom becomes a direct extension of the bedroom because you can always see into it. If you don't have time or resources to to finish a room in your home right now, my go-to method for making spaces look nicer is by keeping them clean. 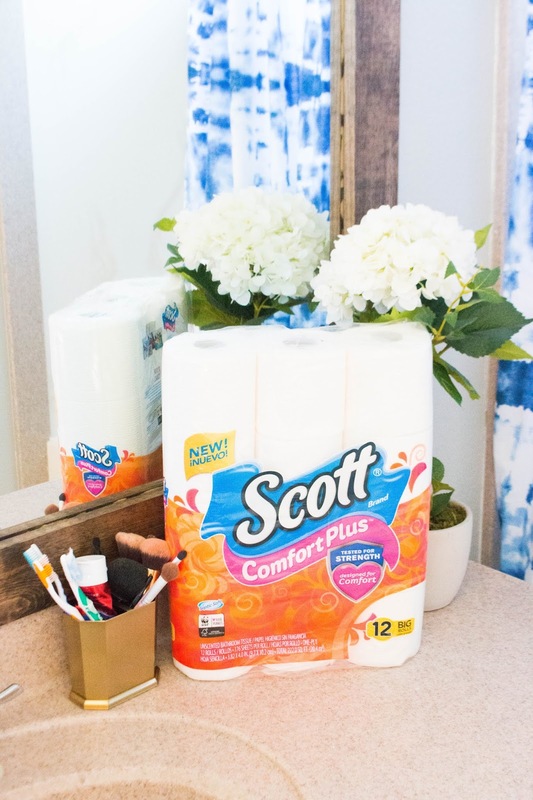 We've loved Scott® Toilet Paper since the beginning of time, and their new Scott® Comfort Plus™ Toilet Paper is the the only bath tissue designed to care for you with everyday comfort, plus a little extra. With thick and plush sheets for a trusted, comforting clean, this Scott® Toilet Paper is tested for strength and designed for comfort. It's three times stronger, while still being septic safe, which is basically the best of both worlds in my book. Aside from toilet paper, I also like to do daily tidying in our bathroom, just so nothing gets too out of hand. 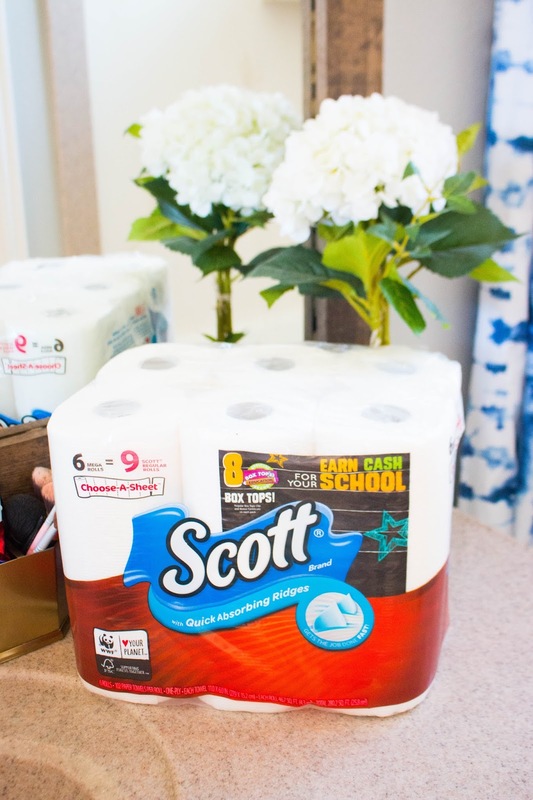 We love using Scott® Brand's absorbent paper towels because they feature unique ridges that quickly and effectively soak up messes, leaving surfaces clean and dry. The first thing we did was paint the cabinets white and add some black modern hardware to the drawers and doors. Then we decided to frame the mirror to give it a nice finished look. Getting a custom made frame for a mirror would have been very expensive. Upwards of hundreds and hundreds of dollars. By making our own with some wood, stain, and adhesive, we were able to put this entire project together for around $30. These were huge savings, at a fraction of the cost, just to get the same look at the end of the day. Totally worth it. The first thing you'll need to do is measure the length and width of your mirror to determine how much wood you need. 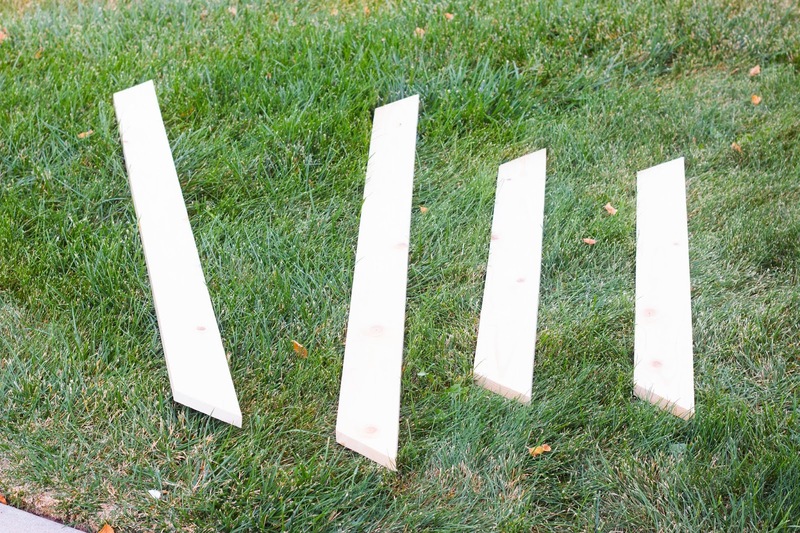 When you have your wood, cut the pieces according to your measurements, cutting the pieces at a 45 degree angle so that all four corners fit nicely together. You'll need two widths, and two length pieces. Once your pieces are cut, you'll stain your wood. 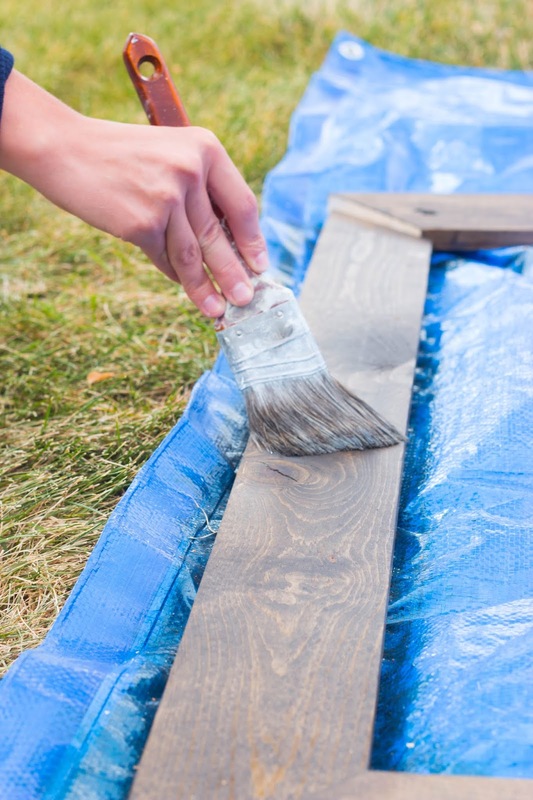 We simply bought a small can of stain at the store, and then painted it on with a brush, and let it dry overnight, before flipping and staining the other side. Because of the reflection in the mirror, you need to stain both sides or else you'll see the raw backside of the boards in the mirror. Trust us, we know. Once your boards are painted, simply apply a bead of caulk to the backside of each board, and adhere them to the mirror. You might want to have a few sets of hands available to press and hold the boards in place while the caulk is drying. After about 15 minutes, everything should be set for you to walk away and admire your handy work. Right now you can purchase Scott® ComfortPlus™ 12ct Big Roll for $4.25 and Scott® Paper Towels 6ct Mega Roll for $5.25 at your local Family Dollar Store. Be sure to bring your $.75 Smart Coupon in between 9/2-10/22 for additional savings! When it comes to art and craft i love it. However DIY i always love. And this one is so awesome. The mirror looks great. I don’t know what genius first decided that putting these huge flat mirrors in bathrooms was a good idea! I loved the stained look. What brand and color choice did you pick for the stain? I love the mirror. Such a simple change makes such a difference. What a darling idea! Simple way to update your bathroom and make it more "today"!! I love the mirror it is so rustic. I also love your shower curtain. Looks amazing! Can't believe it's that easy to make it look like that! This looks like an I redibly easy project to do! I will have to try it out for my bathroom! 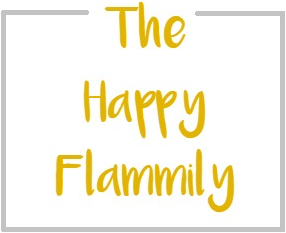 What a fun and great idea. This could be really perfect at home. i will tell my husband to do the same thing. This is so beautiful, I'd love to try this myself someday! What a great crafty project. I love the style of this, it would look fab in our house! This is such a beautiful frame for the bathroom mirror. I really like the farmhouse look! Ohh I love how the frame sticks out against the color of the bathroom. We definitely use Scott tissue too! 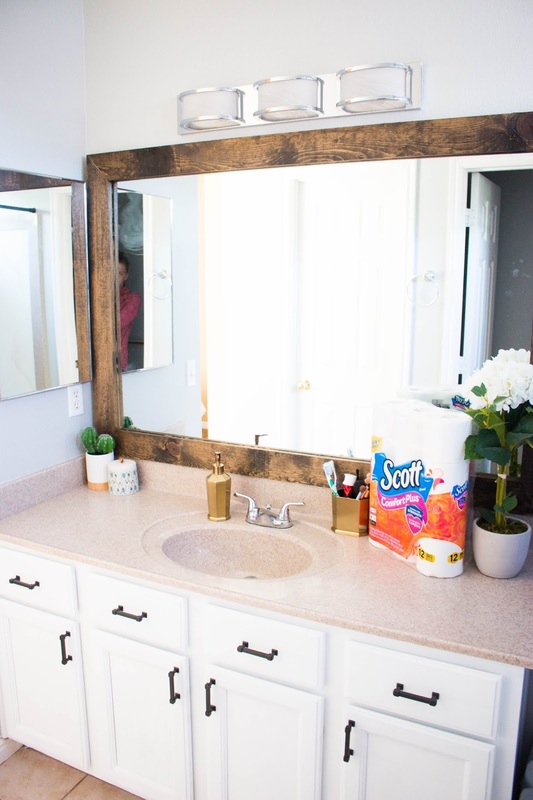 The mirror looks amazing in your bathroom, great DYI project! That mirror turned out beautifully! I love farmhouse style and think you chose the perfect modern curtain to offset the slightly rugged feel. That mirror is absolutely beautiful and I really like it, such a great DIY project. I will ask my husband to make one to put in our bathroom. Oh my gosh, this is stunning! My mum has been wanting to do a farmhouse mirror for her newly renovated bathroom, so I'll be forwarding this along to her! What a wonderful project! 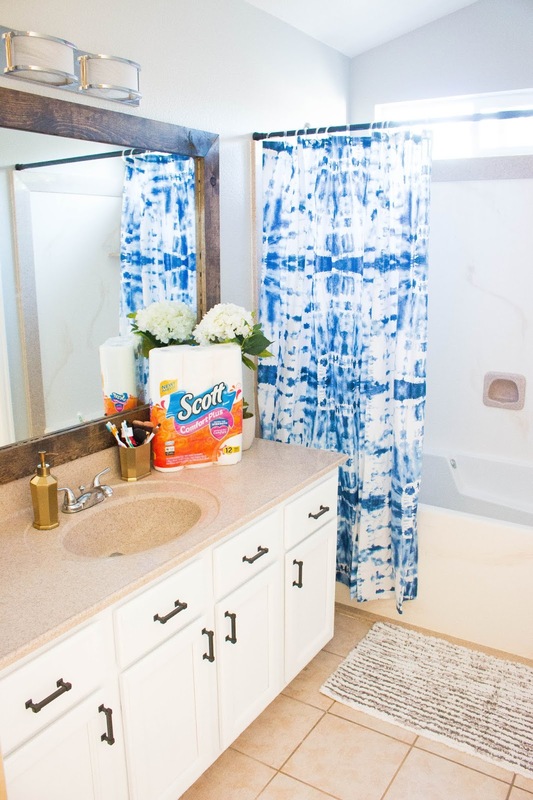 I love the rustic look and it fits just perfectly into your bathroom. 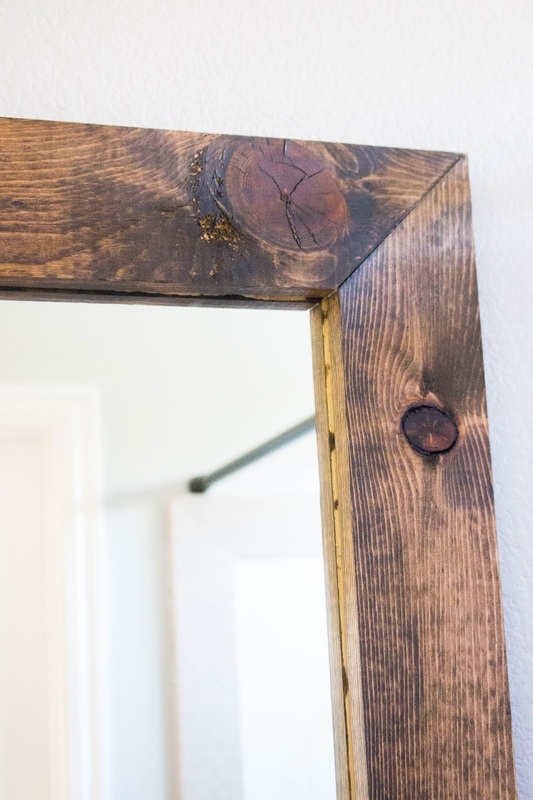 Such a nice DIY project and this mirror is absolutely beautiful. I would love to have this mirror in our bathroom. Love this! 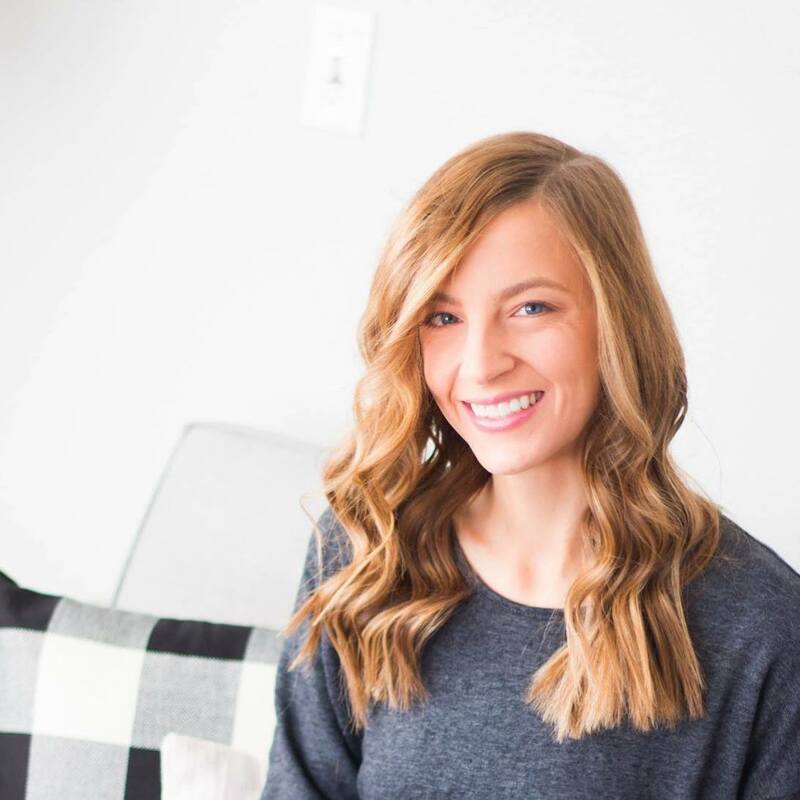 I can't believe such a small change made such a big difference! I need to try more DIY. Love the rustic look of the mirror! It looks very expensive for a DIY one! Your Bathroom is beautiful and this adds to it. I love all things DIY and this one is so pretty. That mirror frame looks brilliant! I have to admit to being a bit rubbish at DIY! I really like this. I was looking for some DIY ideas and this comes in at the right time.